Usually around 7am with Griffin running into my room screaming at the top of his lungs “Mommmmmy wake up!!!!”. On Thursday mornings I sneak out before he wakes up for 7am pilates. My day usually ends somewhere between 11:30pm and 1:30am depending on how many emails I have to catch up on. I typically have a dinner or event commitment every night after work and then when I get home I catch up on emails on our couch in front of the TV. I’m a sucker for The Kardashians, Scandal, Shameless, The Good Wife and The Carrie Diaries. Then it’s my 5 step Somme Institute routine, catching up on Twitter (@CricketsCircle) and Instagram in bed and lights out. I work from the Warby Parker offices (my husband Neil is one of the founders). When Warby first launched, the early team worked out of my office (I am the former designer and founder of jewelry line Rachel Leigh), and they are now repaying the favor. Our small yet mighty team works in a cluster of desks in the middle of their headquarters which is an open office layout. We love the energy they bring to our day and of course the fully stocked kitchen doesn’t hurt either! I’ll call home once a day, usually after nap time, to check in and say hi to Griffin. On Tuesdays my mother-in-law is with Griffin and we can usually expect an unannounced visit to the office which always catches me by surprise and makes my day. Griffin will run into the office screaming “Mommy! Rachel! Where aaarre you!” (he isn’t shy). He’ll usually color at my desk while I finish up whatever I was working on, we’ll visit the kitchen to get him a snack (he loves “puffs” aka Pirates Booty) and then he’ll do his rounds saying hi to everyone on the team. The best thing is having something that’s all about me. When I go to work it’s about my ambitions, goals and passions. 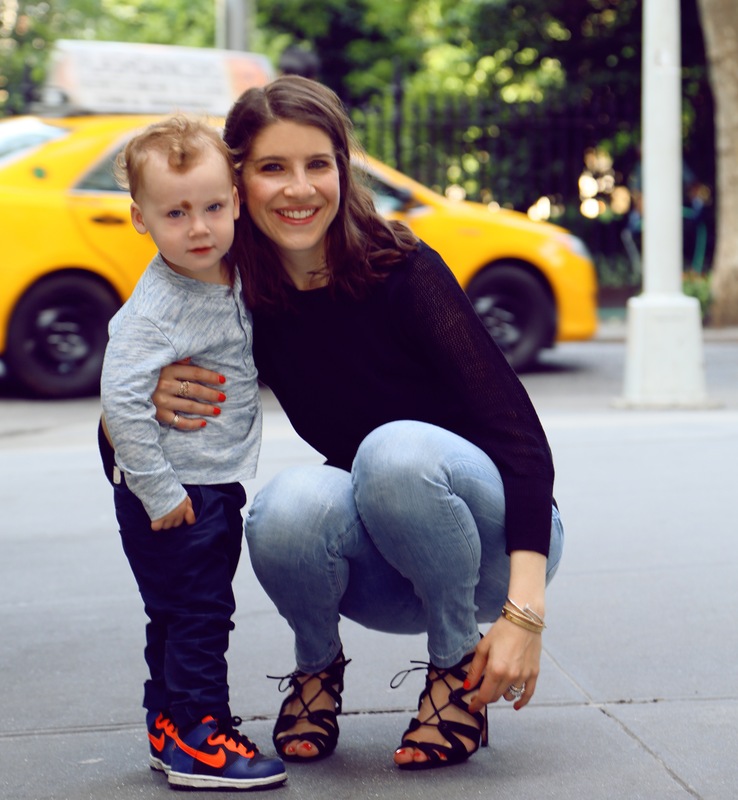 It’s about me having an identity outside of being a “mom” or “Griffin’s mom” which I really appreciate. The hardest part is not being around as much as I would like and worrying I’m going to screw him up not always being there. I make sure I never miss an important event or even the less important moments (taking him for an egg sandwich in the morning), and I hope I am instilling a strong work ethic. When I get to spend the entire day with Griffin I love the freedom of having no commitments or places we have to be. We can decide to do anything we want and we don’t even need a plan. It’s the spontaneity that’s the most enjoyable and memorable. I would definitely miss dressing up every day to go to work (that’s something I can’t live without – it’s my creative outlet). My husband, nanny, mother-in-law, freshdirect.com, diapers.com and my iphone. The Body Collection from Beautycounter – shampoo, conditioner, body wash and lotion – the best luxurious and safe products. J.Crew leather front Pixie pant – I love these because the stretch fabric on the back makes them more comfortable, they don’t stretch out like traditional leather pants and they are less than half the price of all-leather pants. Dry shampoo – it was a game changer for me. I’ve tried them all and love this one by Blow. Lanvin Happy Bag in grosgrain ribbon (link to similar)- the fabric makes it lightweight so I don’t have to worry about filling it to the brim and I can wear it as a messenger or over the shoulder style. Anything Crewcuts! I tend to dress Griffin in clothes his dad would wear like this sweatshirt. Valentino Rockstud patent ballerina flats – a perfect balance of girly yet edgy, they dress up a pair of jeans but are equally appropriate for dinner out at night. Vilebrequin father & son swimsuits. I always appreciate reading these particular posts – particularly the last four questions. It’s inspiring and comforting to see how so many successful working moms find their own way to achieve balance in the many roles they take on. It also never hurts to come away with new ideas for new must-haves of the moment (hello, dry shampoo and those Valentino Rockstud flats I’m now coveting.). Love love love this series! Having kids is something I/We have really been unsure of. I had always been an adamant ‘No’ but for the past year or so my insides are all ‘Babiezzz are soo cute! Have one!’ I love reading this series because it makes me realize that I can still have my career and a family if that’s what we choose. Also, Raluca, you know the absolute coolest ladies!